Home / Life Style / How to make Mutton kaala bhuna! 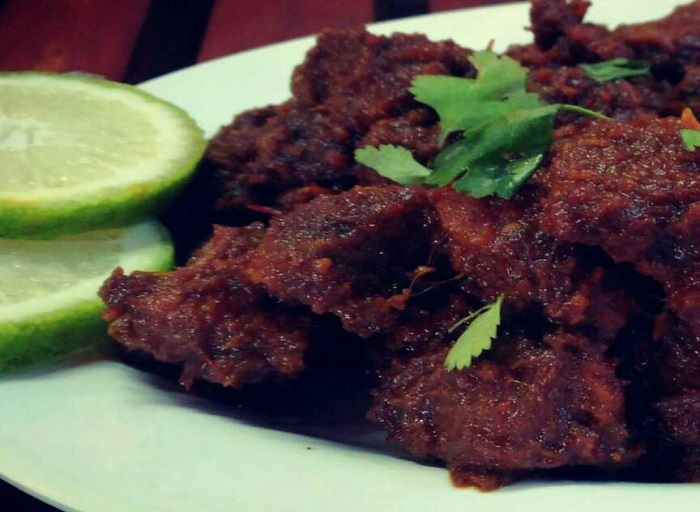 How to make Mutton kaala bhuna! Non-veg eaters all over the world can easily swear by mutton. Curries, bakes and all other preparations with this wonderful meat are always special. Did you know, unlike other dishes, a day-old mutton prep will always be all the more tastier on the palate! Try it the next time you plan on to take on this meat. Put mutton in a bowl, add turmeric powder, salt, yogurt and green chutney, mix and set aside to marinate for 20 minutes. Put mutton with the marinade in a pressure cooker. Add ½ the sliced onion and mix well. Add 1 cup water, mix, cover and cook on high heat for 1 whistle. Reduce heat and cook for 10 minutes. Heat 1 tablespoon oil in a shallow non-stick pan. Add coriander seeds, poppy seeds, cardamoms, cinnamon, cloves, peppercorns, fennel seeds and dried red chilies and sauté till fragrant. Add remaining sliced onion and sauté till onion turns a dark brown. Add dried coconut and sauté till brown. Remove from heat and set aside to cool. Grind the roasted mixture with some water to a coarse paste. Heat remaining oil in a deep non-stick pan. Add bay leaf and caraway seeds and sauté till fragrant. Add garlic and ginger and sauté for a minute. Add chopped onion and sauté till light brown. Add potatoes and mix well. Add some water, mix, cover and cook on low heat for 2 minutes or till the potatoes are half done. Add cooked mutton, mix, cover and cook for 2-3 minutes. Add the ground paste and mix well. Cover and cook on low heat for 2 minutes. Add tamarind pulp, mix well, cover and cook for 2 minutes. Serve hot garnished with green coriander leaves.